A young animal that is developing into an adult. A substance that induces insensitivity to pain. A fully-grown and developed animal. Blood proteins produced in response to and counteracting a specific antigen. A toxin or foreign substance that induces an immune response in the animal’s body. An examination of tissue removed from a living body to discover the presence, cause or extent of a disease. The beveling of both upper and lower P2’s on both sides of the equine’s mouth, which helps reduce irritation caused by the bit as it bumps the front edges of the teeth when pressure is applied. A female horse used for producing foals. Removing the reproductive organs of a male. An illness that is persisting for a long time or constantly reoccurring. A required blood test that proves the horse is free of the equine infectious anemia disease. When a mare does not have normal uterine activity that is required to clear the uterus of excessive fluid after breeding. A branch of medicine that’s involved in the study, diagnosis, prevention and treatment of diseases, disorders and conditions of oral cavities and associated structures, and their impact on the body. The kinds of food that an animal habitually eats. A condition that causes inflammation of the lining in a female animal’s uterus. A horse or other member of the horse family. A medical inspection of a specified kind. Activity requiring physical effort, to help sustain or improve health and fitness. The action of taking out something, especially using effort or force. A small insect that feeds on the blood of mammals and birds, which can infect and transmit diseases through its bite. Medical concerns that result from fleas can include tapeworm, flea allergy dermatitis, flea bite anemia and Lyme disease. Giving special attention to a young horse, as the first month of their life is the most crucial. Giving an animal special care due to old age. Giving a neat and tidy appearance to an animal. Includes services such as bathing, nail clipping, hair brushing and hair cutting. A parasitic worm that infects the hearts of dogs and other animals when bitten by an infected mosquito carrying a heartworm parasite. Heartworm, if left untreated, can be fatal. Medical concerns that result from heartworm can include labored breathing, coughing, vomiting, weight loss and fatigue. The study of the physiology of the blood. A large group of animals, especially hoofed mammals, that live, feed or migrate together or are kept together as livestock. Without assistance from outside an organization; completed internally. A narrow-edged tooth at the front of the mouth, adapted for cutting. A deep cut or tear, especially on skin. The inability to walk normally because of an injury or illness affecting the leg or foot. Sizable animals that require their own set of care and treatment. 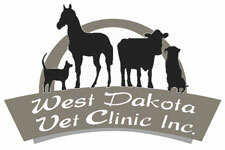 West Dakota Veterinary Clinic treats cattle, goats, sheep, pigs, llamas and alpaca. A grinding tooth at the back of an animal’s mouth. A procedure performed to realign the molar-to-incisor balance and aid a horse in chewing properly again. The branch of medicine that deals with the anatomy, functions and organic disorders of nerves and the nervous system. The removal of a male animal’s reproductive organs. A medical procedure that does not require the introduction of instruments into the body. Where medicinal drugs are dispensed and sold. Ensures the well-being of a female horse, and also helps ensure the chances of conceiving again. An exam performed before purchasing a horse to identify any preexisting problems that may hinder a horse’s future performance and reduce buyer risk. An instruction written by a medical practitioner that allows a patient to be provided with medicine or treatment. Designed to keep something such as an illness, harm or accidents from occurring. A series of actions carried through in a certain order or manner. An image produced by an X-ray machine used in a medical examination. The action of making something smaller or less in amount, degree or size. Restore health with training and therapy after an illness or injury. The production of offspring by a sexual or asexual process. Animals of little size. West Dakota Veterinary Clinic treats: dogs, cats, rabbits and other small animals (i.e., guinea pigs, gerbils, hamsters, rats and mice). In good condition; something that is not damaged, injured or diseased. The removal of a female’s reproductive organs. An uncastrated adult male horse. A row of stitches holding together the edges of a wound or incision. Using a male horse to check if a mare is in season and receptive to the stallion for breeding purposes. An external parasite that feeds on the blood of animals such as canines. Medical concerns that result from a tick can include Lyme disease, ehrlichiosis and Rocky Mountain spotted fever. An infection at the root of a tooth or between the gum and a tooth usually caused by severe tooth decay. A device used externally in animals for evaluation of soft tissue and tendon injuries, as well as internally for reproductive exams such as evaluations of the reproductive tract and pregnancy detection. A treatment option for mares with delayed uterine clearance who are susceptible to persistent mating-induced endometritis and other uterine pathologies. The established code of procedure or behavior related to the process of administering a vaccine to an animal. A substance used to stimulate the production of antibodies and provide immunity against certain diseases. A person qualified to treat and attend to animals. The state or condition of being in good physical and mental health.